way! It'd be great for those on fixed income (I remember my retired Grandmother giving $50 to a "Christmas Ministry" every year). 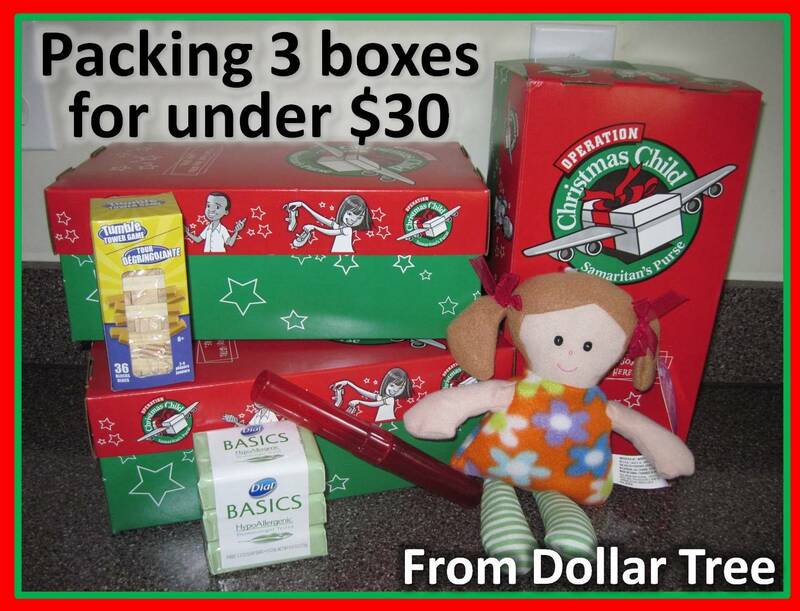 Or a young family with a limited budget, but want to teach their kids to share with those in need. And if you have a couple more dollars, you can always grab a couple more items. I picked Dollar Tree since it's in my town, and they are in all 48 contiguous states, and you could get everything needed there. Some items may actually be cheaper at Walmart-or at another dollar store you may be able to find cheaper or bigger packs of school supplies, or your store may not have everything listed, or have something else that catches your eye. 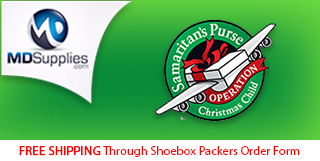 This is just an example of how you can simply, quickly, & affordably pack 3 shoeboxes. Personally I might add more, (you can see one of my boxes here) but these would be good for the children who received them-all the basics covered! And depending on exactly what you find/pick it should just about fill up a GoBox. 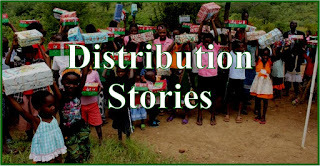 Be sure to keep in mind as you pick items, that this may not only be the only gifts these children get this year-it may be the only gifts they'll ever get, so look at the items as you pick them to find quality items. (I think we've sent most of these items ourselves over the years). Maybe pick something sturdy like dominoes which have no moving parts to break instead of a cheap Rubik's cube we want to give them things that won't break soon. Pack it with love. A good rule of thumb is would I give this to my child, grandchild, or friend's child? 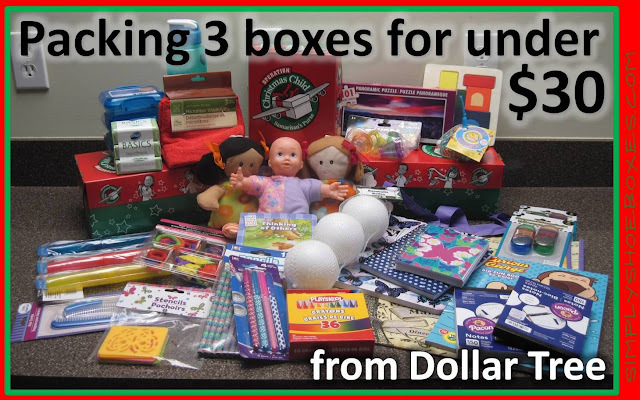 Also, keep in mind that Samaritan's Purse suggests starting with a "Wow" item-something that will thrill the child when they see it and love for a long time (doll, stuffed animal, collapsed soccer ball, big car, etc.) so keep that in mind as you pick out your items. Remain aware of what can not be sent. 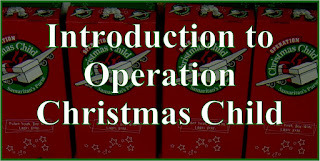 For the USA: "Candy; toothpaste; used or damaged items; war-related items such as toy guns, knives, or military figures; chocolate or food; seeds; fruit rolls or other fruit snacks; drink mixes (powdered or liquid); liquids or lotions; medications or vitamins; breakable items such as snow globes or glass containers; aerosol cans." (more here). Have fun picking items with love-make it personal! You may have new items lying around your house to add-that promotional baseball hat you'll never wear, the scarf that was a gift-but not your color, the stuffed animal that held a gift card, a reusable shopping bag you've never used, etc. 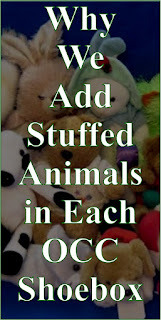 If you have children maybe a toy they received but didn't like & never played with. 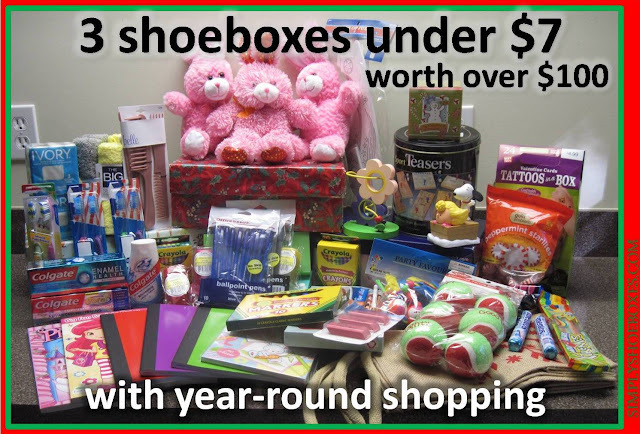 Anything that would be good for a shoebox! Not trying to pass off junk, but share good items we're not using. You can either add it, or substitute for something on the list below (like if you have a stuffed animal) then use that money towards more items! 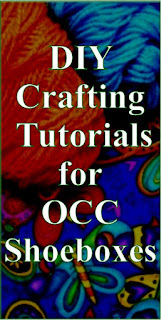 If you craft, be sure to check out our Craft Tutorials for lots of quick projects to add to your boxes...many using things most "crafters" already have on hand. 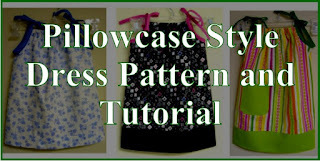 UPDATE: This list now contains affiliate links and I will be compensated if you make a purchase after clicking on them. **As of 2017 candy is no longer allowed. Another mutlipack item can be substituted. 4 3 multi-packs of items. 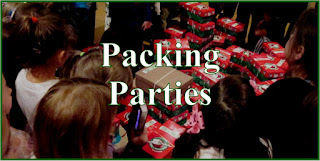 See what you can find-large sheets of stickers to split up, whistles or mixed sturdy party favors, socks, if you're doing girls-hair bows or jewelry, boys-multi-packs of cars, or screwdrivers, use your imagination-have fun...it's like a treasure hunt! 3 single special items-one for each box like a cup, harmonica (I marked this off the list because I heard it doesn't work well), hat, sewing kit, picture board book, tote bag (great for carrying their goodies in), etc. to personalize the boxes and fill them up. EDITED TO ADD: Playskool Crayons. 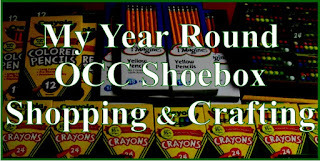 Or if you store carries CraZArt or Crayola you can get those, I'd avoid the off brand, we tested a few brands of crayons, and are personally getting CraZArt at back to school sales for our boxes, but feel Playskool is also okay. 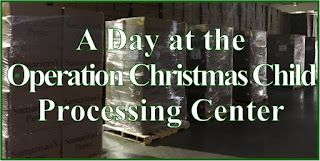 You'll end up with an extra pen, & pencil you can divide among the boxes based on room-can always use another of those. You'll also have an extra pencil sharpener, and depending on the multi-packs of bonus items you get, you may have extras of those, I'd include them if you have space-the children can trade with other recipients or enjoy having something to give as a gift. 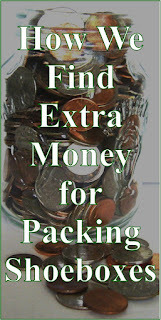 You'll notice a key part of being able to do this is splitting up multi-packs between boxes, so it'd be hard to say pack one box for $10, although you could get together with friends and/or family-either you could make an event of going shopping together. 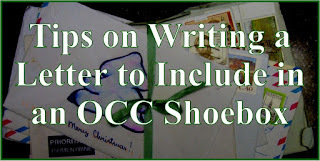 Or if there are three of you, you could divide the list: everyone can get their own coloring paper, lined paper, doll/stuffed animal, game/toy, special item, and misc multi-packs. Person A could get the combs, toothbrushes, soap, & washcloths. Person B could get the pens, pencils, & pencil sharpers. Person C could get the balls, crayons, and candy. Updated: I actually went shopping at Dollar Tree to try this out. 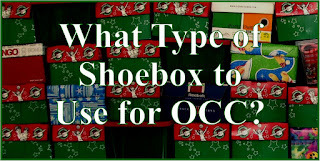 You can see the details of this in action in this post: Packing Three OCC Shoeboxes for Under $30. 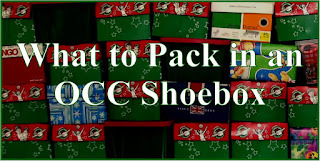 You can get an idea of our year round shopping by checking out our series of posts on Shoebox Stockpile Saturday ~ Adding to Our Operation Christmas Child Shoebox Stockpile. Sarah posts each Saturday our shopping trips for the week. 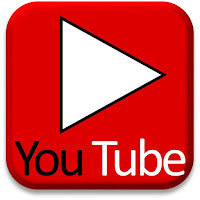 UPDATE: This post now contains affiliate links and I will be compensated if you make a purchase after clicking on my links, that is how I afford the time to write the blog and keep up this page. FWIW - our Dollar Tree has 3-packs of mini-composition books, and 3-packs of small coloring books. Both fit into the GO boxes better than the full-sized versions.